With festive season round the corner, our latest collection with the warmth of beautiful breathtaking combination of elegance, dignity, grace and cheerfulness of bright hues, is a warm welcome to this celebration time. 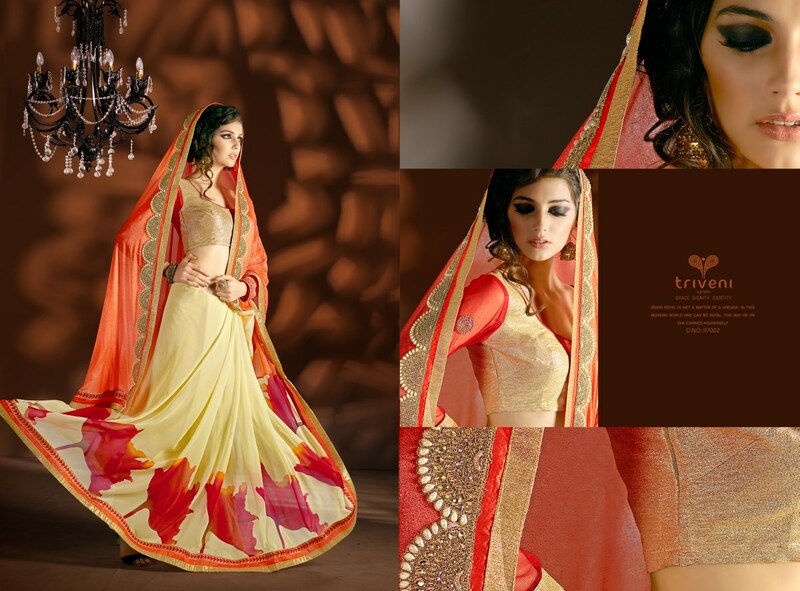 The latest collections’ release by Triveni comprises of party wear sarees with one exclusive lehenga saree. 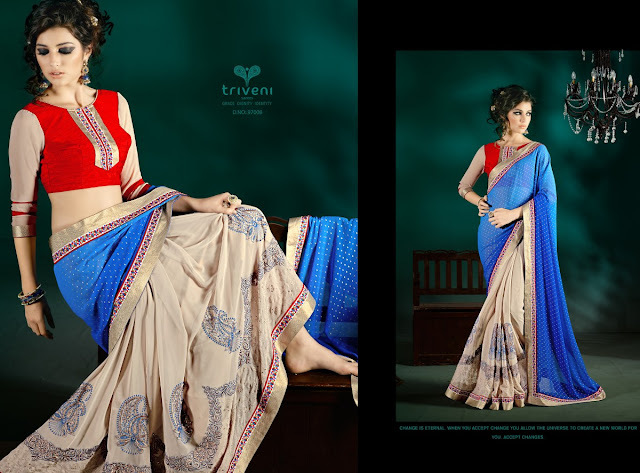 Triveni’s latest collection of party wear sarees, Jhumri (Vol.4) is for a woman of substance. Enhancing looks and personality is not the only objective; the dressing must enhance the grace and confidence. The inherent confidence to carry oneself with ultimate grace and dignity enables to create an everlasting impression. Complementing the beautiful sarees, in this collection, are equally beautifully crafted unique blouses in various fabrics with attractive embroidery. This collection has a plethora of fabrics and patterns to choose from. Chiffon, georgette, jacquard, printed fabrics, brasso, satin / velvet for blouses and borders and shaded fabrics offer you a vast choice in a single collection. Also the attractive borders and embroidery in embroidered patches, stone work, foil work, hand patches, cut work and machine embroidery represent the magic story in the collection. Exclusive and intricate embroidered; Bhagalpuri and brocade borders provide a majestic look to the collection. You now have every opportunity to make your personal style statement, this festive season, with this exclusive collection. Being graceful and elegant was never so easy! Their saree collection is quite nice.